Batgirl 13 is my first taste of the 'Death of the Family' Story arch. It is also the conclusion of an already open Batgirl story arch. In issue 12 we saw Barbara getting roughed up by Knightfall (a messed up your woman with awesome dress sense) with Batwoman assisting in the battle. The first prints of this issue have a Joker mask 'wrap' around them that although quite a gimmick gives you sign that DC are pulling out all the stops for this event. 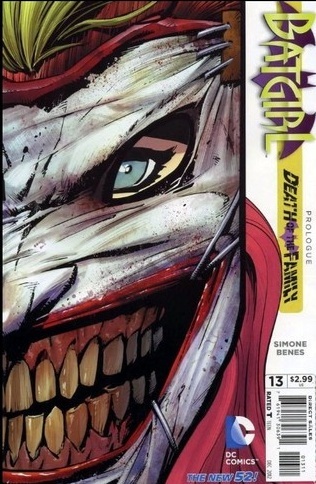 It's a very nice cover and under the joker mask is barbara's face and nothing else. It's simple and striking. After issue 12 we had a month off as we experienced the poignant issue zero and now with that gap we see Barbara finally finish this fight. 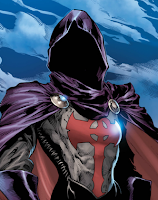 I have to say when I read the issue zero I thought it was pointless backstory but by the end of issue 13 I can see why its important history rather than just filler. In the last few issues we have seen Batwoman coming into Barbara's world. This worked wonderfully to highlight the 'Girl' in Batgirl and makes the reader very aware that this is young woman who although talented and skilled she is not on the same level as the more mature heroes. Standing next to Batwoman, Barbara looks like a child and even she accepts that this woman is her superior in both skill and 'bat-family' rank. I won't drop any spoilers here but as openings to an epic story arch go this one (and its just a prelude) blew me away. Gail Simone tells this story with insight into the character that few writers have and you can really feel the drama as you read the last few pages. The art of Ed Benes is wonderful and the action flows through the pages effortlessly it's really top tier stuff for any dedicated Batgirl reader. There are also a few moments in the issue where Barbara is drawn in a way that makes her look stunningly beautiful without exploiting the characters femininity. It's respectful of the character at all times and if this is the level of writing and art that 'Death of the Family' will have on offer then its going to be a very memorable event. My only criticism is that I felt the Knightfall fight deserved a tighter ending and a littler more exposition but i can see why starting a new story arch at this point worked well and it's always best to want more of a character than be saturated in filler. I just hope this event won't overshadow the Batgirl narrative for too long as I look forward to seeing more of Knightfall and the Gordon family.